Created in the 1400s, the pear cut diamond still retains its popularity today. Diamond cutter, Lodewyk van Berquem, invented a diamond-polishing wheel that enabled every facet of the diamond to be polished–a turning point in which all pear shaped diamonds going forward had the opportunity to exhibit superb light return and sparkle. What is a pear shape diamond? 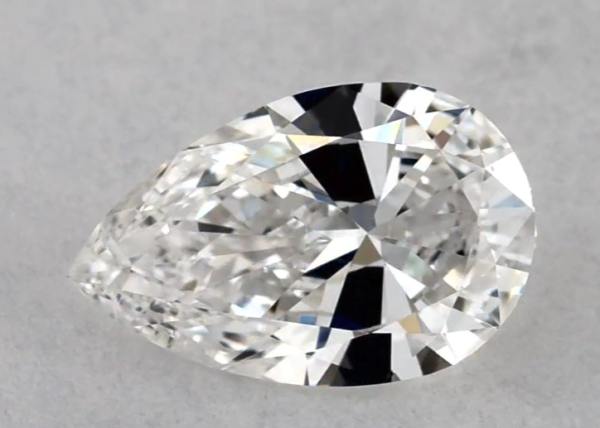 The pear diamond—also known as the teardrop or pendeloque cut—is unlike any other diamond cut. It’s called a modified brilliant cut, one that blends the Marquise and oval cuts with one rounded end and a point on the other. Its signature silhouette is instantly recognised and much beloved. Why should I choose a pear diamond? 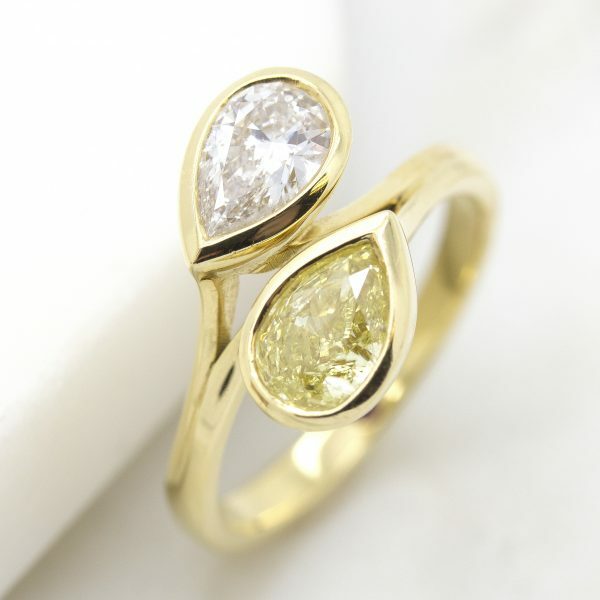 The pear has a similar faceting structure to the round brilliant cuts. Because of this, it retains that coveted fire and brilliance that makes a diamond sparkle. 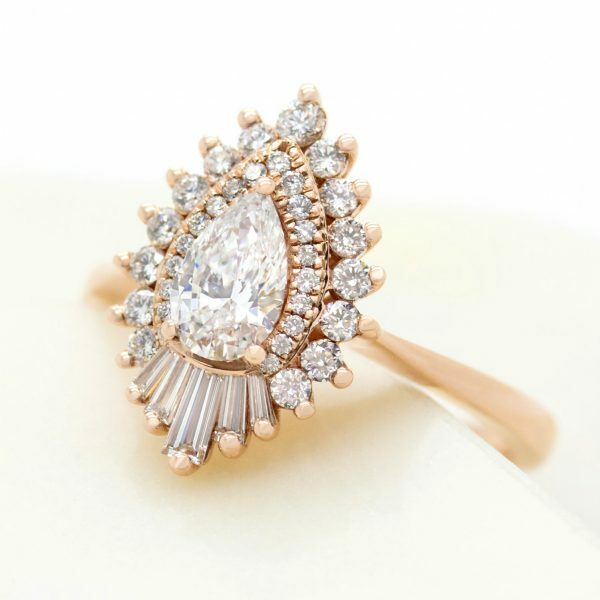 The pear shape can be worn with the tip pointing upwards or downwards on the finger, so it is a shape of juxtapositions. The shape has dynamism to it, feeling classic, yet making a strong statement. And the pear diamond trend hasn’t gone unnoticed by celebrities–stars from Katherine Heigl, Victoria Beckham and Cardi B all wear pear diamond engagement rings. Some pear shaped diamonds may have a bow-tie effect, which occurs when light doesn’t bounce into the middle of the diamond, because of the way the diamond is cut. This appears as a bow-tie shape darkness visible in the center of the diamond. While most agree that this is part of a pear diamond’s beauty, a severe effect is undesirable. All of our diamonds are hand-inspected to ensure they do not possess a strongly visible bow-tie effect. 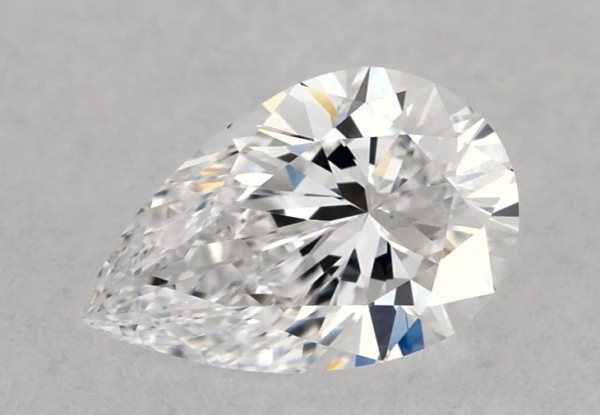 The video below displays a pear shaped diamond with a severe bow tie effect. Symmetry is very important when choosing any fancy-shaped diamond like the pear. To ensure the beautiful soft curves are even and the point is centred, choose a symmetry grade of Excellent (EX) or Very Good (VG). While pear cut diamonds don’t have an official cut grade, the chart below serves as a general guide to use when considering the cut of a pear shape diamond. Ratio is pear cut diamonds is down to personal preference and style. A narrow, elongated pear shape is achieved with a higher ratio, while a more rounded, wider pear is achieved with a lower ratio. The choice really is yours. While pear cut diamonds don’t have an official cut grade, the chart below offers general guidelines to follow when considering the cut of a pear cut diamond. As a rule of thumb, pear diamonds should possess excellent or very good symmetry to ensure that the tip of the pear lines up with the middle of the rounded end. What colour is the best for a pear cut diamond? Evaluating colour in pear cut diamonds is dependent on the preference of its buyer or wearer–customers may prefer the warmer tones of colour grades G-H to the icy cool tones of colour grades D-F. The truth is, the difference between these two colour grade ranges is difficult to perceive, especially to the naked eye. However, colour is often more visible towards the tip of the pear shape itself. To ensure an even tone throughout the stone, we recommend a H colour grade or above. What clarity is best for pear diamonds? Like with most diamond shapes, clarity in pear cut diamonds is dependent on personal preference. Some people may be entirely comfortable with a diamond that features clarity characteristics that aren’t visible to the naked eye, while others may insist on a technically flawless appearance for absolute perfection. 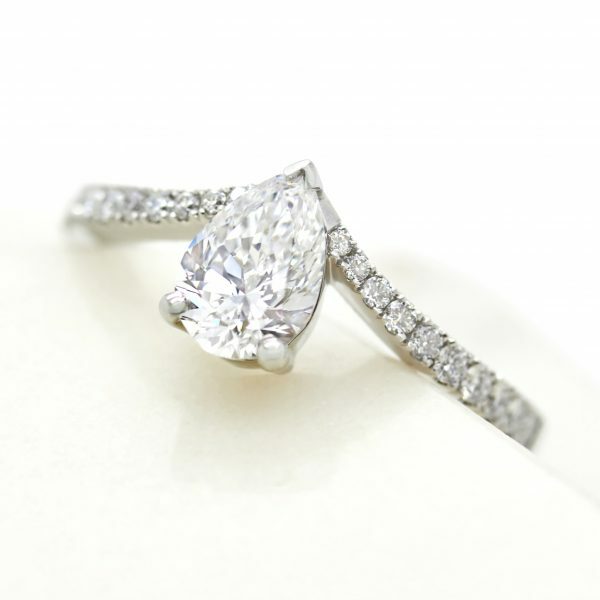 Below is a guide that will help you when considering clarity in pear shape diamonds. Choose a stone shape to begin your search.